Medicines management: who should have the meningitis ACWY vaccine? Teenagers and ‘freshers’ are being advised to have a vaccination to prevent meningitis W disease, says Matt Griffiths. Meningitis strain W cases are on the rise in England. In 2009, there were 22 cases, increasing to 117 by 2014. The number is expected to rise again this year unless more vaccinations take place. The risk of contracting the disease is increased through communal living and close contact, so one of the groups considered to be at a high risk of infection is ‘freshers’ – first-year university students. 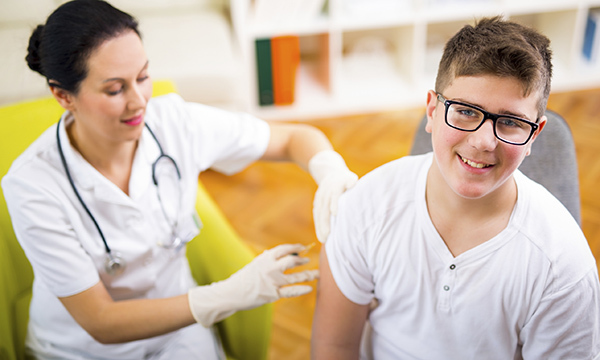 As they mix closely with large groups of new people, some of whom may carry the meningococcal bacteria, they are being requested to have the meningococcal ACWY (MenACWY) vaccination before they start university or as soon as possible thereafter. MenACWY protects against four different causes of meningitis and septicaemia including strain W.
Another group being targeted is teenagers – aged 14 and above – to ensure they are vaccinated before they leave school. They will be offered the MenACWY vaccine as part of routine school programmes, alongside the 3-in-1 teenage booster and as a replacement for the meningitis C vaccine. As well as ensuring they have some protection against the effects of this terrible illness, vaccination is recommended for these groups because larger numbers of take-up will help achieve herd immunity. Herd immunity occurs when the vaccination of a large portion of a population provides some form of protection for people who have not developed immunity. Increased numbers of vaccinations mean fewer people will be susceptible and be able to spread the disease. The number of people needed to have been vaccinated to achieve herd immunity varies from disease to disease, but higher numbers of take-up of vaccines will certainly help to achieve this and protect the most vulnerable people in society who haven’t been vaccinated due to age or illness.